Reference number for this case: 15-sep-54-Carpiquet. Thank you for including this reference number in any correspondence with me regarding this case. Meteorologists, who have already explained four appearances of "saucers" out of five also bear a heavy responsibility in the case of "saucers": they create from scratch phenomena with their balloons and nephoscopic projectors. To study the characteristics of the atmosphere and deduce "the weather for tomorrow" or the sky condition that the plane on the departure will encounter, they use indeed many windbag balloons. The radio carried by these devices automatically transmits the values of the temperature and humidity depending on the pressure, that is to say, the altitude. The speed and the direction of the wind, however, can only be deduced by the trajectory of the balloon. We need the balloon to be visible in clear weather or recognizable by radar in heavy weather. And this characteristic is the basis of many "testimonies". Two examples will suffice. Just a few months ago British reservists in training following the spot of a balloon on their radar screen and gave the alert. On September 22, a farmer from Carpiquet, near Caen, would have been mistaken if an insider had not reassured him. It must be remembered here that weather stations release every day in France, a dozen of large volume balloon (two meters in diameter at the start and eight meters in altitude) and more than 150 smaller balloons. No error is obviously possible at low altitude. But at a great height, with the reflections of sunset or dawn, when the surface of the earth is already in the shade, the balloons take a different aspect. Should a cloud make a screen or should a balloon reach a maximum altitude and burst to go back down and the disappearance becomes supernatural. We identified in France, nineteen cases of craft observed at dusk, motionless in the heaven and that mysteriously disappeared without noise and smoke, "as if they dissolved in the air." Meteorologists actually do not need the complicity of the sun to give us illusions, some of their activities can be misleading in the heart of darkness. They launch, especially during the night, other balloon equipped with a light to measure the height of the cloud ceiling. The craft averaging 100 meters per minute, it is simple enough to note the time between the release and the disappearance of the light to find the altitude. The professional sees nothing wrong with that. The layman on the contrary who watches that light go up vertically and dissolve suddenly entering the clouds may wonder about it. Mr. Clausse, Head of Information at the National Meteorology revealed during a Technical conference given at the Aero Club of France that three other types of light spots could wander in the sky. "- The first are produced by the beam of a projector directed vertically over the clouds. They are observed from a neighboring station whose distance is known and the measurement of the angle between the horizontal and the direction of the spot is enough to determine the cloud ceiling. - The seconds are powerful flashes of light whose reflection impresses a photocell." These are so to speak emissions of a radar visual waves: "The latter combine the latest projector from the process and the cell through the use of a pulse AC poser and the light (purple) of this device called ceilometer remain visible all night. Unless, of course, the clouds disappear before." Because the clouds still play here an important role. If a projector is pointed at the sky, a bright spot is visible on the basis of the lower formation, but the latter being pushed by the wind, the spot can go through a hole and go to project itself to a higher formation. To anyone away from its vertical, it jumped. Let's also mention the meteorites of the big shooting star kind and especially airplanes flying at very high altitude. Reduced to barely visible points and too distant to be audible, these can shine, suddenly, in the setting sun, and disappear also quickly. In Sceaux, on June 26, 1952, dozens of people taking the fresh air at 9 p.m., on the doorsteps, saw strange luminous dots cross the sky in silence, and the alarm was given. We had to learn the next day that these craft, entirely conventional, indulged in an exercise on the edge of the stratosphere. Physicists also bring their "anti-saucerist" collaboration by specifying some absolutely phenomena natural. Dr. Haffner, among others, professor of astronomy at the University of Hamburg and Section Head at the observatory Hamburg-Bergedorf, believes that altitude lightning events can be mistaken to "saucers". "It has been observed, he said, at ten kilometers of altitude fireballs up to 260 meters in diameter and because of their rotation, they are often flattened; it happens that the form of discs or cigars of the objects often give the impression that they are rotating on themselves. The size, shape, speed, color, brightness, duration and dissolution mode of these fireballs are remarkably similar to descriptions of "flying saucers". They can change shape and direction in less a second like the "saucers". Finally they disintegrate always suddenly, sometimes silently, sometimes with a loud bang." All these explanations have allowed US technicians to nullify 86% of the reported apparitions. Remember also that not one of these phenomena could be observed in details, only a few dreamers or crooks having indulged in elaborate quickly ineligible because of their contradictions. The few pictures gathered by the US special committees show natural phenomena in which the diverging drop shadows denounce the hoax. Unexplained and troubling cases remain. Certainly, June 8, 1952 a "cigar" has evolved, near Dijon, producing smoke white and emitting a growling sound. And that on 27 October the same year, a customs officer in Marignane saw an unknown machine, come to the landing strip. It is also certain that a half-cigar shaped craft moved on September 17 over Rome, attracting the attention of thousands of people. but it is also true that often incomplete observations favor the mystery. - Witnesses wrongly evaluate the altitude and speed of what they see. They have no way to do this and there is evidence that in plane crashes profane testimonies rarely coincide with reality. Even airmen allow themselves to estimate an altitude only when they are fully aware of the apparatus. All witnesses, however, can specify the shape of the object (remembering that because of atmospheric scattering everything seems more or less round). They can then locate the source of the light, check if the machine has its own shadow (an atmospheric phenomenon has no shadow) and specify the form of its path (straight, curved or varied). They should finally note the time, the position relative to landmarks and size relative to a known object held at arm's length for example. It is certainly necessary to try to solve the last puzzle and do to this scientifically. Maybe we will know then, if the "saucers" exist and, if their existence is proven, where they come from. Although scientists leave us little illusions about their earthly origin rather than their coming from another world. At 0800 hours on 15 September, according to the report of Leclere, a newspaper agent in Carpiquet, Calvados Department, a white point of light appeared in the sky and grew rapidly in size. It was oval-shaped and had unusual brilliance. The phenomenon lasted 2 minutes. The witness stated that he was not subject to hallucination. A similar phenomenon was reportedly seen by a farmer in Thaon, also in Calvados Department. Aimé Michel indicates that in Carpiquet, a village which is between Caen and Arromanches, witnesses saw a circular, luminous and white object observed during two minutes, on September 15, 1954, at eight o'clock. "I initially saw a white shining point. It quickly grew bigger while coming on us. At the time of its greater proximity, it had the shape of an ellipse (I saw its profile). Then it moved away while decreasing from volume and disappeared in the north on the horizon." The two ufologists and authors indicate that on September 15, 1954 close to Caen at 8 o'clock a circular object was observed in flight by several witnesses, according to Aimé Michel in "A Propos des Soucoupes Volantes". September 15, 8 o'clock: According to the report by Lecière, a Press correspondent in Carpiquet (Calvados), a witness to see during 2 mn a point of white light appears in the sky and increases his size quickly, revealing an oval form and an unusual brightness. The witness would deny to have had a hallucination, and a similar observation is made in Thaon (Calvados) [unusual objects observed above Normandy, Frank-Tireur, Paris, September 16, 1954]. Luc Chastan indicates that in the Calvados in Carpiquet on September 15, 1954, at 08:00 hours, "a witness sees during 2 mn a dot of white light appearing in the sky and quickly increasing in size, revealing an oval form and an unusual brightness." The website indicates that on 15 September 1954 at 08:00 in Carpiquet, France, "An unidentified object was sighted, but with appearance and behavior that most likely would have a conventional explanation. One white elliptical was observed by one witness at a village for two minutes (Leclerc)." The sources are listed as Michel, Aime, Flying Saucers and the Straight-Line Mystery, S. G. Phillips, New York, 1958; Vallee, Jacques, Computerized Catalog (N = 3073); Hall, Richard H., UFO Reports from the Files of the CIA, Fund for UFO Research, Washington; Hatch, Larry, *U* computer database, Author, Redwood City, 2002. [er1] Article in the regional newspaper L'Est Républicain, France, page 1, October 8, 1954. 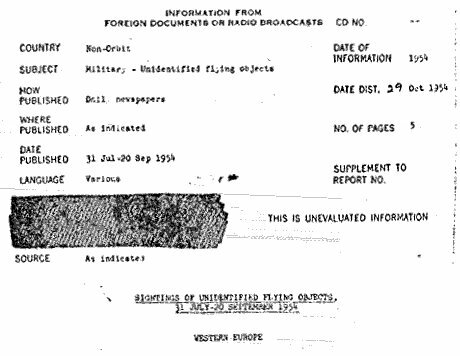 [ci1] "Information from Foreign Documents or Radio Broadcast - Sightings of Unidentified Flying Objects, 31 July - 20 September 1954", report by the CIA (Central Intelligence Agency, USA), pp 1,2-3, October 29, 1954. [fr1] "OVNI, Premier Dossier Complet des Rencontres Rapprochées en France", book by Michel Figuet and Jean Louis Ruchon, Alain Lefeuvre publisher, France, page 78, 1979.